Sugar has been getting a bad rap in the media in recent years when it comes to our general health as well as dental health. But is sugar only bad news when it comes to our dental health? The answer might not be as straight forward as you think. 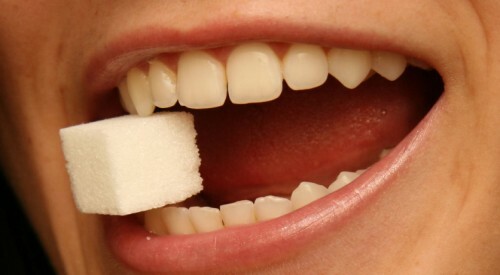 Research done on human teeth coming from areas where sugar was rare, showed that decay pretty much did not exist. It seems as though it has only become an issue since our modern diets have introduced refined sugars. However, these studies revealed that gum disease was quite prevalent as well as damaged and worn teeth. This means that even if you completely cut sugar out of your diet, you can still get dental problems. One of the main factors when it comes to sugar causing decay is not ‘how much’ but ‘how often’ sugar is consumed. The way that decay occurs is when specific bacteria feed on these sugars and then produce an acid, which then starts dissolving tooth away starting the decay process. These bacteria don’t need a lot of sugar to be able to do this but what they do need is to be fed often. This means that if you were to buy a block of chocolate for yourself on your weekly grocery run, you would be better off eating the whole block of chocolate in one sitting rather than having a small piece 5 times a day for the entire week. To add to this, these decay-causing bacteria can also feed on natural sugars like fruit, honey and lactose in milk. In summary, sugar can still be a part of a healthy diet but just needs to be used in moderation.